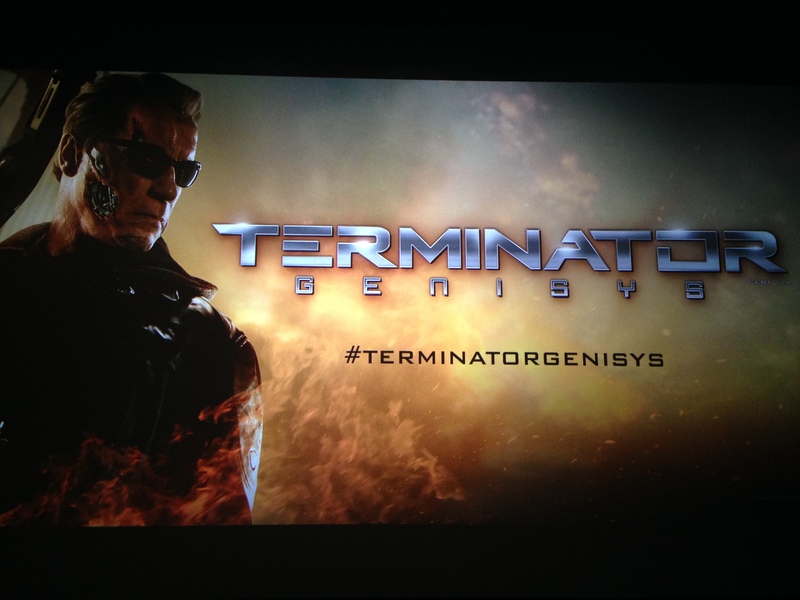 Last night I attended an exclusive twenty-minute sneak peek of Alan Taylor’s upcoming July blockbuster TERMINATOR: GENISYS at Vue Westfield London. 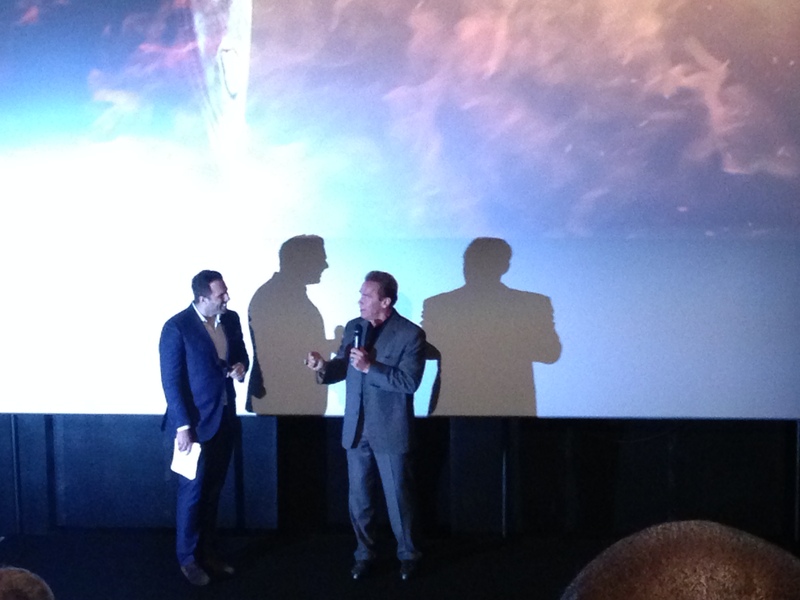 To add to that, the one and only Arnold Schwarzenegger was in town to treat us to an intimate and insightful Q&A following the preview arranged by Paramount Pictures. 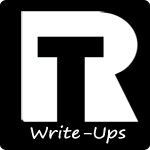 *SPOILERS ALERT* – Skip to the Q&A section at the bottom of the page if you want to avoid. Set in 2029, John Connor (Dawn of the Planet of the Apes’ Jason Clarke), the leader of the human resistance, has sent his loyal lieutenant Kyle Reese (Divergent’s Jai Courtney) back to 1984 to protect Sarah and the future before her. Meanwhile, in 1984 (on the date when Arnold Schwarzenegger’s original T-800 was sent back in time to kill Sarah Connor in order to prevent the birth of John Connor), Sarah Connor (Game of Thrones’ Emilia Clarke) has grown up with Arnold Schwarzenegger’s T-800 since he travelled back in time to save her as a young girl, helping him to blend in with civilization and has even nicknamed him “Pops”. This unexpected turn of events has created a fractured timeline, a confused Kyle Reese and an unexpected ally in “the Guardian” (Arnold Schwarzenegger). As the war against machines rages on, Skynet has a new plan to attack John in both the future and the past, in order to alter the face of warfare forever. With the very familiar T-1000 (now played by Byung-hun Lee) and more enemies on the horizon, Sarah Connor, Kyle Reese and the Guardian fight to reset the future and prevent “Judgement Day” from ever happening. Due to the ownership of rights for the first two films, every scene which they needed to feature in the fifth instalment of the franchise had to be completely re-created from scratch. However, this results in some incredible scenes, such as the first one we were shown. In order to re-create the moment where the T-800 first graced the big screen, CGI was imposed on young Arnie’s body double Brett Azar. As he imitates the humans before him, ordering them to give him their clothes, an infamous voice utters the words “You Won’t Be Needing Those!” As he unveils his face from his hooded jacket, the “Old. Not Obsolete” Arnold Schwarzenegger walks up to his younger-self with his trusted friend, his shotgun. This impressive moment was then followed by a whirlwind of adrenaline-fuelled action and classic TERMINATOR comedy, involving the T-1000 and an unexpected enemy in John Connor, known as the T-3000 in this feature film. Unfortunately, us fans may not have gotten to see the entire film on the beautiful 4K Cinema Screen, but luckily Paramount had an even bigger treat in store for us, a Q&A, hosted by Paramount’s Marketing Director John Fletcher, and journalist and broadcaster Dan Wooton. 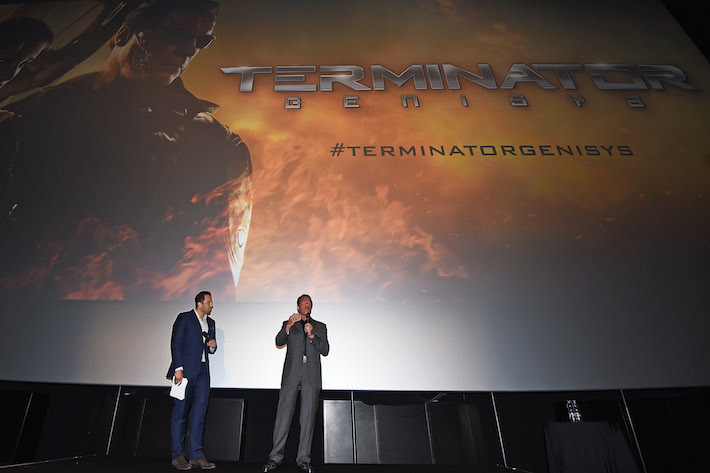 Initially asked about the quality of the film, Arnold Schwarzenegger had nothing but praise for the way it has turned out and mentioned how he was only going to return to make a TERMINATOR film if the script was brilliant and that is what swayed him eventually. He mentioned how there was almost a perfect balance between bringing in the old plots with the new storyline. He went on to sing his praise for London and the UK, where he began his bodybuilding career, going on to become Mr Universe at the age of twenty. We gathered that he had quite a love for the capital from the pictures which were circulating Twitter yesterday of him riding Boris Bikes around London. The whole night was an incredible experience and one which I will cherish for years to come. Personally it completely changed my outlook on the new film and made me more excited than I have been all year for its release! A must see this summer! 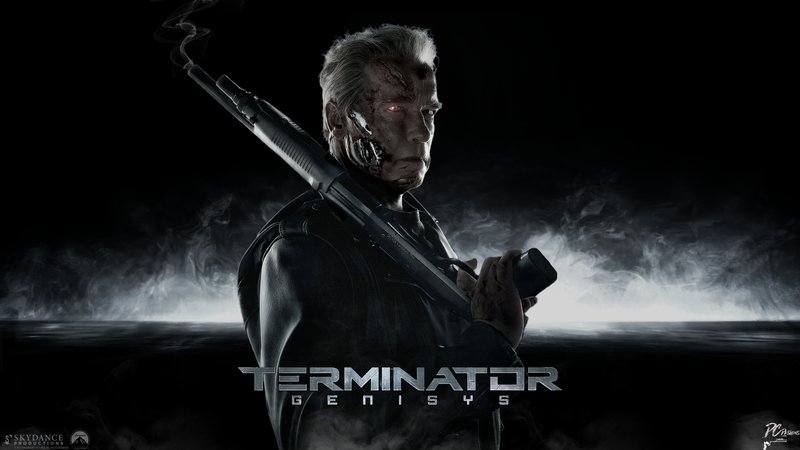 TERMINATOR: GENISYS stars Emilia Clarke, Arnold Schwarzenegger, Jason Clarke, Jai Courtney, Byung-hun Lee, Matt Smith, Courtney B. Vance and J.K. Simmons. The sci-fi sequel, directed by THOR: THE DARK WORLD’s Alan Taylor, is set for cinemas July 2. Check highlights of the night’s event and the latest feature proving Arnold is back!